Can anyone help work out what's wrong with my torch coral. It's been like this for a few days. I first though it might be sulking if something had bumped into it, but no such luck. There's an asterias starfish on the side of it, but I don't think it's doing any harm, as I have hundreds of them, so one would have come across this coral a long time ago. There also seems to be some dark blobs on the tips of a few of the retracted tentacles - could this be brown jelly? First off i cant see any sign of brown jelly , as a rule it starts to come off in strings as the coralis infected and breaks down and is normaly in response to injury and or infection . The movement of the Asterina could be annoying it , as far as i know the grey ones are OK ? The green ones are the problem but i may be wrong ,some one will tell us im sure. I cant see any sign of flat worms tho i once had a Gonipora full of them and it didnt seem to mind . No changes in water ? not been repositioned near to anything? It's been in a few weeks, sat next to my Frogspawn - Euphyllia yaeyamaensis . I believe that Euphyllias dont sting each other, or have I got that wrong? It's the side closest to the frogspawn that's the problem. I've moved it to the front on the sand so I can keep a close eye on it for now. Might give it an iodine dip later to be safe. Logically if thier the same family you would think they might not attack each other but TBH i dont know, at least you have moved it now . another thought , look at it after dark very very carefully for signs of a Tritonia or 2 , in case ive used the wrong word those annoying white sea slugs that eat corals. Is it right that you're a long time since last water change? There could be some minerals depleted they rely on or accumulated something that's bothering it. I don't see any sign of brown jelly either. It doesn't look like it in the picture, but it's not being battered by flow is it? I think I'll take a look under blues later (although I'll be drunk, as I'm out tonight :cool:). For now it is in a calmer spot, away from the other corals, so maybe it will recover on it's own. I did about 20% water change a couple of months ago when I set up the HT. Other than that, no water changes, ever. All the other corals are healthy and growing well. I'll check out a few other options before doing a water change - I really keen to prove their not needed (pretty sure there's a discussion somewhere on here about that). Happy to be proved wrong, but seems odd that it's just one coral if it's a problem with the water. I ran a Berlin system for many years in excess of 4 or more and it was still healthy when i broke it down and it never had a water change. If you do have probs with nitrate then little and often is the thing as it is less of a shock to the inhabitants , new salt water is nasty in quantity . Yep, that pretty much sums it up. Along with the fact that just by feeding a variety of foods, you add trace elements, as all the algae, plankton, shrimps, etc. are all built of this stuff. Maybe summat bumped it and damaged it, looks like the head is receeding and about to leave the skeleton. 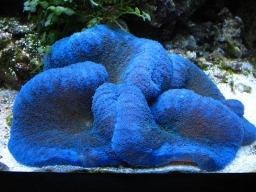 I'm pretty sure the the frogspawn has sweepers, so it could well be a sting or if another coral is sulking such as a softie it could be releasing "toxins" into the water, all just theory's. It seems to have picked up a bit today. A little more extension. Not getting too excited yet.